Week 11 of the NFL regular season schedule has been completed, giving us an even larger sample size to delve into just how each of the 2018 NFL Draft first-round picks has fared in their respective action so far. Some of the 32 first-rounders have not qualified for a grade either based on small snap counts or not playing altogether. On the other hand, some players have jumped out of the screen and have helped strengthen their teams. 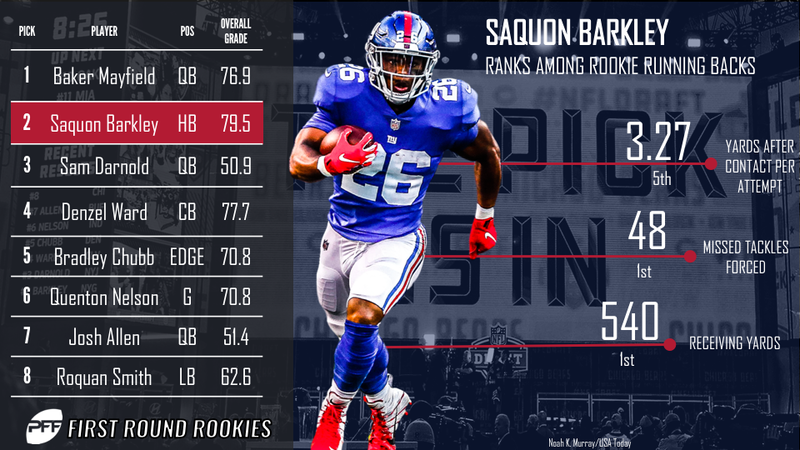 After a couple of really rough outings, the first overall pick returned to his best in his team’s Week 10 victory over the Falcons. On just 23 dropbacks, a career-low for the former Heisman winner, he completed 17-of-20 attempts for 216 yards and three touchdowns, en route to 10.8 yards per attempt and a passing grade of 84.1 – his highest single-game marks to date. Barkley was given the ball a whopping 27 times in his team’s victory over the Buccaneers, and he used those carries to rack up a career-high 142 rushing yards, with 124 of those coming after contact. He ended the week with averaging 4.59 yards after contact per rushing attempt – the fourth-best mark among qualifying backs this week. As Darnold’s Week 6 game showed, the former USC signal-caller is more than capable of delivering exceptional performances under center, but unfortunately for Darnold, the bad performances are vastly outweighing the good ones right now. Darnold had his lowest-graded game to date against the Dolphins in Week 9, completing just 21-of-39 attempts for 229 yards, four interceptions and he threw an incredible six turnover-worthy passes on the afternoon. Darnold has thrown 17 turnover-worthy passes this season, four more than the next closest quarterback. Denzel Ward only managed eight snaps in the Browns’ Week 9 game before he succumbed to a hip injury, but he returned in full force to help his team to victory over the Falcons in Week 10. He played all of his team’s defensive snaps for the sixth time in 10 professional games, and he was his usual self in coverage, where he allowed four catches from seven targets for 46 yards. All told, he allowed a passer rating of 77.1, but that could have been even better, as he was unable to hold onto an errant Matt Ryan throw that could have easily resulted in an interception. Coming off a Week 10 bye, it was business as usual for Bradley Chubb in Week 11. He added a sack, a hit and three hurries from his 36 pass-rushing snaps but he was outstanding in run defense, where he ended the game with five defensive stops and an elite run defense grade of 90.0.